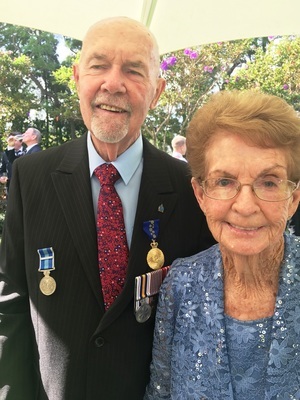 Ken and Margaret Martin after the OAM ceremony at Government House. Ken Martin left the Stanthorpe district many years ago but he certainly left his mark on the Granite Belt community through his work as uncompromising but fair QPS detective and a bit of a character. At the time he was heavily involved in sport and introduced Baseball to the sporting community. After leaving Stanthorpe, Martin went on to enjoy a significant career in the Police Force and later in private security. Early in the year in the Australia Day honours list, Martin was awarded an OAM. Last week in a ceremony at Government House in front of his extended family Martin received his OAM from the Queensland Governor Paul de Jersey. The citation listed his significant services to community safety through anti-crime initiatives with Crime Stoppers Queensland the Queensland Retired Police Association and the QPS. It is well deserved recognition that Martin would never have sought or expected but which is richly deserved.